The easiest way to stay up to date with all Aruba information is to download the FREE Visit Aruba mobile app available for iPhone and Android. In addition to having convenient access to all the VisitAruba Plus benefits, you also get a convenient mobile travel guide for Aruba. The Visit Aruba app is a handy mobile guide for your Aruba vacation and includes up to date information on things to do, restaurants, accommodations, car rentals, news, events & specials with the convenience of making reservations. For VisitAruba Plus discount card members, all offers are now conveniently included in the app for quick and easy reference. The app has been completely redesigned in 2016 including a new tablet-specific design, It also features handy maps indicating your position and different points of interest plus a convenient trip planner where you can add places and activities. Best of all the app is completely FREE to download and use and its information is available offline so you incur NO ROAMING FEES! 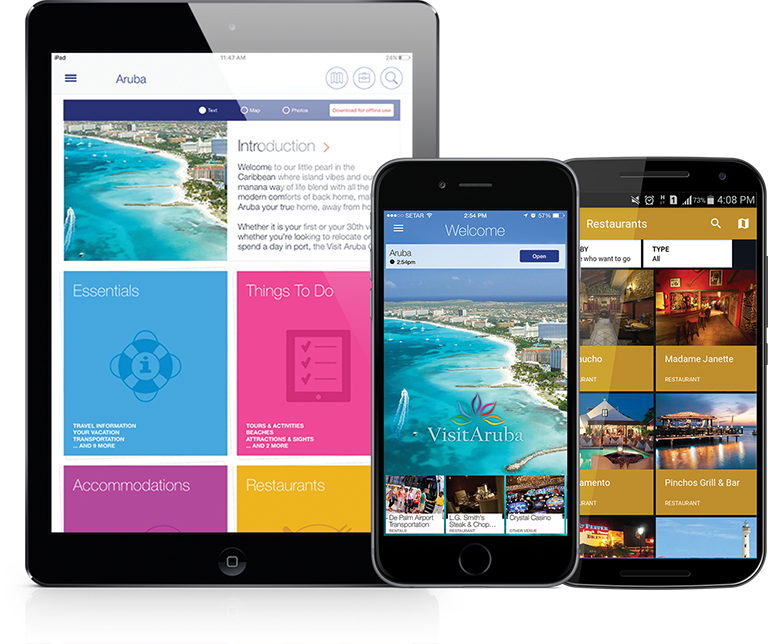 The Visit Aruba app is available in the App Store and Google Play by simply doing a search for “Visit Aruba”.